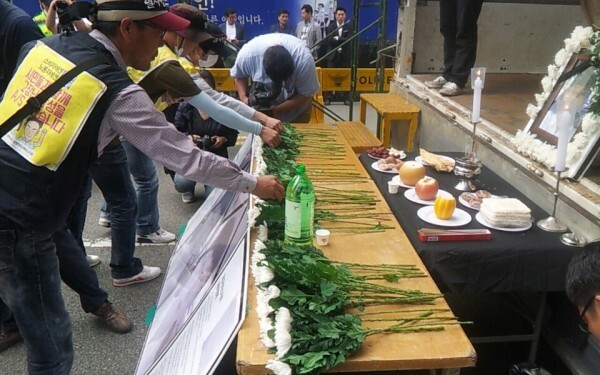 YEOM, Hoseok, the 33-year old chapter chair of the Yangsan Chapter of the Korean Metal Workers’ Union (KMWU) Samsung Electronics Service Workers’ Local, committed suicide in protest of Samsung’s labor repression on May 17, 2014. He left two notes containing his dying wishes, one for his parents and one for the union members, calling on them to succeed in the struggle for labor rights at Samsung. Samsung has clung to a “no union” corporate policy for some 75 years and the KMWU Samsung Electronics Service Workers’ Local is the first mass-membership union at Samsung in Korea. The KMWU local has been in labor dispute with rolling strikes calling on Samsung to end the piece rate wage system that has left the workers in poverty, to respect trade union rights and to conclude a first collective bargaining agreement for the 1600 unionized workers’ wages and working conditions. After months of avoiding bargaining, Samsung began retaliating against the workers by reassigning their jobs to the non-unionized—thereby cutting their wages—and closing 3 of the unionized centers (Haeundae Center, Asan Center, Icheon Center) with mass dismissal of those workers in March. YEOM’s wake was being held in room 5 of the 2nd floor of Seoul Medical Center Gangnam Branch—which is less than 3.8 km from Samsung Electronics Global Headquarters and 3.6 km from Samsung Chairman LEE Kun Hee’s hospital room—when the Korean police broke in and absconded with Yeom’s body. On May 18, 2014 the police stormed YEOM’s wake at Seoul Medical Center and took his dead body. With no warning, some 50 mourners found themselves sprayed with tear gas and colliding with some 300 police forces entering the premises. The police arrested 25 union members and many suffered injuries. Labor martyr YEOM had already left his dying wishes—that “when you find my body, please lay it in state until the day of our victory”—in a written suicide note. In his last note to his family, he requested, “Please entrust my funeral process to the union local.” The union had received the family’s written authorization for the matters regarding his funeral and was making preparations to adhere to his dying wishes. However, after the local decided upon an all-out strike to protest, YEOM’s father revealed that he changed his mind and wanted to hold a family funeral in Busan. Labor martyr CHOI, Jong-beom’s bereaved wife and the union begged the family, “Let’s respect Chapter leader YEOM’s dying wishes.” YEOM’s father had mentioned the previous day that Busan-Yangsan Police Office had conveyed an offer of 150 million KRW (about USD$147,000 or 107,000 euro) on the 17th at Mungyeong, on his way from Busan to Gang-neung to see his son’s dead body, but that he had turned down the offer. Yet within ten minutes of his speaking to the police again on the 18th, at 6:20 pm, a huge police force was mobilized to the wake, bursting into the hospital mortuary area. Saying, “No not like this (violent seizure of my son’s body),” YEOM’s father asked the police to withdraw a total of three times; however, the police ignored his calls and absconded with the body. Currently local chapter leader YEOM’s corpse has been moved to Haenglim Hospital mortuary in Busan City, some 390 km away from Samsung Global Headquarters. In response, the KMWU Samsung Electronics Service Workers’ Local began an all-out strike on May 19th. The striking union members have gathered in front of Samsung Electronics Global headquarters in Seocho-dong, Seoul. KMWU will release further struggle plans following the Central Executive Committee meeting on the 20th. Yeom was one of the founding members of the Samsung Electronics Service Workers’ Local and was elected chair of the Yangsan Center Chapter. Samsung had been squeezing the unionized workers financially by redistricting work away from the unionized centers to giving it to non-union centers, resulting in reduced workload, which translates directly into sub-minimum wage earnings because the workers are paid totally on a piece-rate commission system. Owing to Samsung’s redistricting work away from the unionized centers, deceased chapter chair YEOM earned only 700,000 KRW (US$685 or 499 euro) of wages in March and only 410,000 KRW (US$401 or 292 euro) in April (compare: minimum wage in South Korea is 1,088,890 KRW per month, or about US$1,065 dollars or about 777 euro). Calling “Win a collective bargaining agreement! Win living wages! Stop labor repression!” he participated in a strike beginning May 9, 2014 and joined the struggle in front of the Samsung Electronics Global Headquarters in Seoul from May 12th to 14th. He disappeared on May 15th. He was found on the 17th together with two suicide notes in Gang-neung. Writing in his suicide note his hope that “like the sun, which will rise again tomorrow, our local will win this fight without fail,” he met his end in Gang-neung by the eastern coastline where the sun rising above the ocean can be seen. 2014.6.16 Edit (Urgent Call): Please take a minute to click on your language below to send a protest message to Korean government and Samsung Group Vice Chairman Jay Lee (grandson of Samsung Group founder). (VIDEO) Samsung’s Corporate Responsibility as Seen by its Workers! Edit: Samsung Group Chairman LEE Kun-hee was at the top of the list for the world’s worst boss ; however, at the eleventh hour he was overtaken by CEO of Amazon.